"A Form that unleashes the Keyblade's true power." Final Form is a Drive Form that unleashes the Keyblade's true power which appears in Kingdom Hearts II. It uses both of Sora's party members, and consumes five of Sora's Drive Bars. It represents Sora's completion, and can be unlocked after Sora and Roxas come to terms at the Dive to the Heart. Its emblem is a white wave. 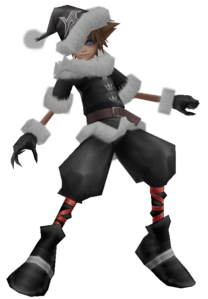 This form changes Sora's clothes to silvery white and black, with the symbols on his pants somewhat resembling an eye with a wind pattern. This may be referenced to the fact that while Anti-Form resembles a Heartless, Final Form, which is silvery white and possesses the traits of Nobodies, can be obtained after Roxas comes to terms with Sora. Each Keyblade seems to move with an arm, though when Sora stops moving they hover behind him. Thus, every move is an attack in itself. No matter what world Sora is on, while in Final Form, he never touches the ground unless he lands from a jump. Sora's hair and clothes slowly flow as if he is being held by the wind. His clothes also systematically glow white on and off for the duration of the time he is in the form. There are also two large sparkles of pure white light that move randomly around Sora with a white wisp following them. When Sora is standing still, the position of his Keyblades seem to represent folded angel wings. When he floats (which he does instead of walking and running), they open, as if Sora is flying. Although Final Form is unlocked after fighting Roxas, it is not added to the Drive menu right away. It first activates randomly when trying to Drive into another Form, after which it can be used like any other Form. Equipping the Light & Darkness ability will increase the chances of randomly activating Final Form. Final Form is a powerful form that gives Sora the ability to wield two Keyblades through telekinesis. Physical attacks are extremely quick and powerful with new finishers that deal high amounts of damage. The floating Keyblades automatically attack when performing actions, like jumping and gliding. Magic is also made more powerful, as individual spells perform differently than usual. 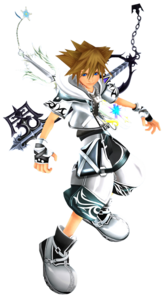 Final Form also has drastic mobility changes; Sora floats above the ground instead of walking, jumps higher than usual, and has the Growth Ability to glide. The Keyblades can also be used as a shield as well as a weapon. When gliding, the Keyblades spin forming a shield in front of Sora to block incoming attacks. Final Form gains an experience point for each Nobody defeated, including Organization members. Leveling up Final Form will upgrade the Growth Ability, Glide, for itself and Sora's standard form. Also, leveling up Final Form grants Auto Final and two Form Boost abilities to Sora's standard form. Final Arcana Lv1 Handling the Keyblade with great skill, unleashes a powerful finishing combo move to a single target. Final Strike Lv1 While spinning in midair, deals a powerful finishing combo move to a single target. Final Arts Lv1 Unleashes a powerful finishing combo move to get rid of several targets at once. Auto Assault Lv1 The Keyblade automatically unleashes attacks in various situations. Crime & Punishment Lv1 A Keyblade held in each hand unleashes powerful magic spells. Auto Final Lv2 (Standard) Automatically sets the Reaction Command to Final in a pinch, if Final Form is usable. Lv3 (Standard) Press in mid-air to ride the wind. Keep the button pressed down for longer action. Synch Blade Lv1 Allows Sora to wield two Keyblades at once. Lv6 (Standard) Increases the duration of the user's Drive Forms, slowing down the consumption of the Form Gauge. MP Haste Lv1 MP recharges at 1.25 times the original speed. 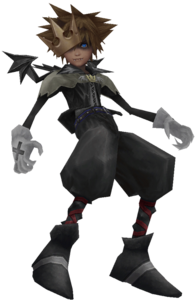 Final Form turns Sora into a living weapon; simply making contact with enemies while gliding or jumping does damage. Final Form is useful against all enemies, because Sora's power, speed, and magic are dramatically increased. Like Wisdom Form, Sora glides along the ground rather than running, and becomes able to perform commands while moving. His casting is sped up and all his magic finishers increase in power and area of effect as well. Always be prepared to cast Curaga if needed, as there are no party members to help. Since Final Form levels by defeating Nobodies, it is best to avoid using it while fighting Heartless. Try to defeat enemies as fast as possible by mixing up standard attacks with magic. The best Keyblades for training Final Form are the Bond of Flame, whose Fire Boost makes it easier to quickly slay Nobodies, or the Fatal Crest and Fenrir, which have excellent stats. The Ultima Weapon's MP Hastega is very useful in making it easier to slay Nobodies, while Oathkeeper's Form Boost allows Sora to remain in Final Form longer. Given Final Form's attacks cover a wide area, one could equip Oblivion as Sora's main Keyblade so he can quickly recover Drive Bars while his MP is recharging. The best locations to train at are the Mysterious Tower and Naught's Skyway in the Castle That Never Was, as they have Nobodies to fight rather than Heartless; Naught's Skyway is also close to the Proof of Existence, allowing Sora to quickly refill his Drive Gauge. As activating Final Form reduces the amount of points by 10 on AntiForm's hidden counter, extensively using this form can make it easier to activate Valor Form, Wisdom Form, Limit Form, and Master Form during battle without the risk of accidentally triggering AntiForm by mistake. ↑ Yen Sid's mirror: "An image of the Keyblade unleashing its ultimate power flows into your mind."